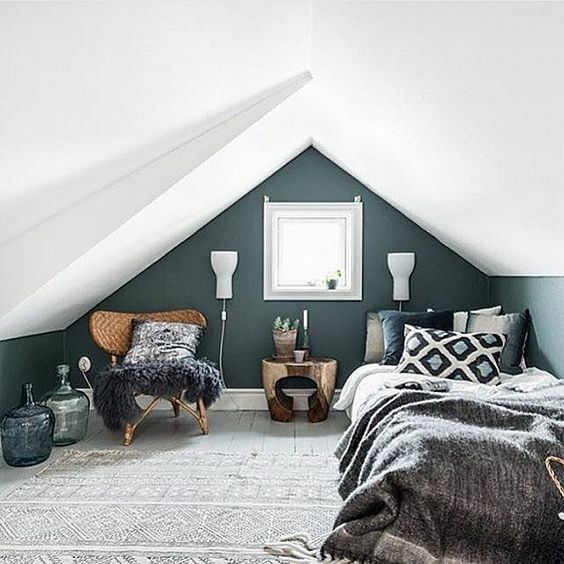 Decorating an attic bedroom is not always easy. 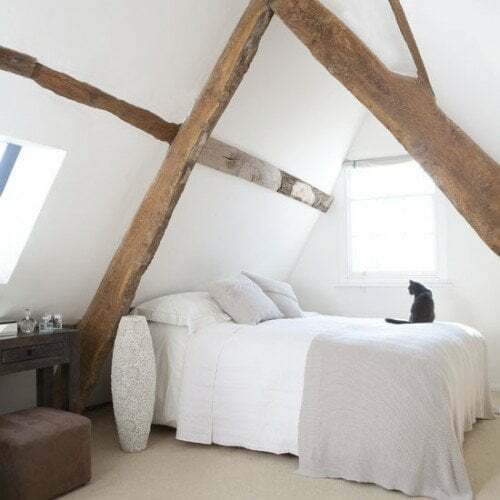 But transforming a dark and cramped attic into a stunning bedroom is not as difficult as you might think. You need a strategy from the beginning to give you enough natural light, functionality and space for storage. You want the bones of your attic to also be your features. Always be thinking less is more and only then add your element of surprise. That could be a dramatic wall color, a glass internal wall, over-sized slanted windows or clever storage so your room looks almost bare. Most of the time attics are reserved for storage. But why waste the space? If you add clever storage, a window seat and beautiful lighting you could create a very cozy space that also adds to the value of your home. In an unfinished attic, the goal of insulation is to keep the rooms below cool in summer and warm in winter. Typically insulation stops at the attic bedroom floor. For an attic bedroom you need a finished attic with attic insulation of R-30 in all the right places including your door and walls. 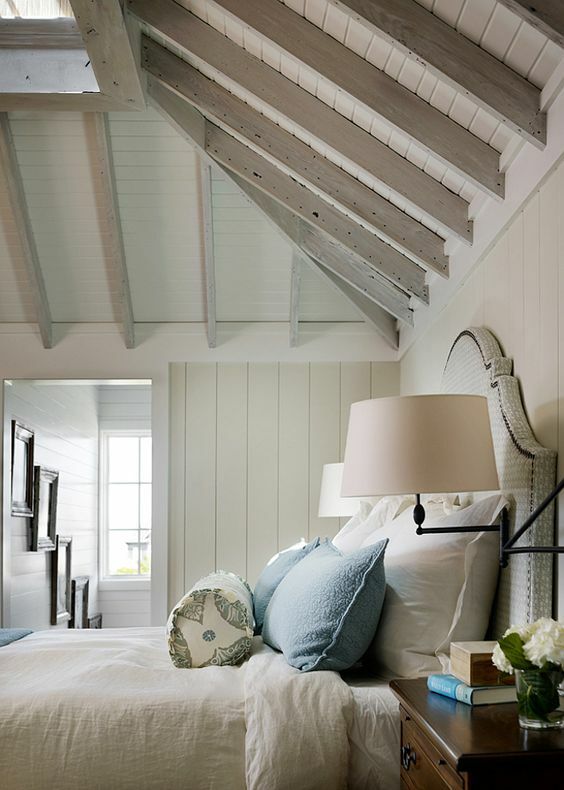 A light or white paint color for your slanted ceiling creates a feeling of space. It also reflects more natural light, which is perfect if your windows are small. Dark ceilings create a cave effect and make you feel closed in. That doesn't mean you can't add dark contrasting features, like beams, but they must be limited. 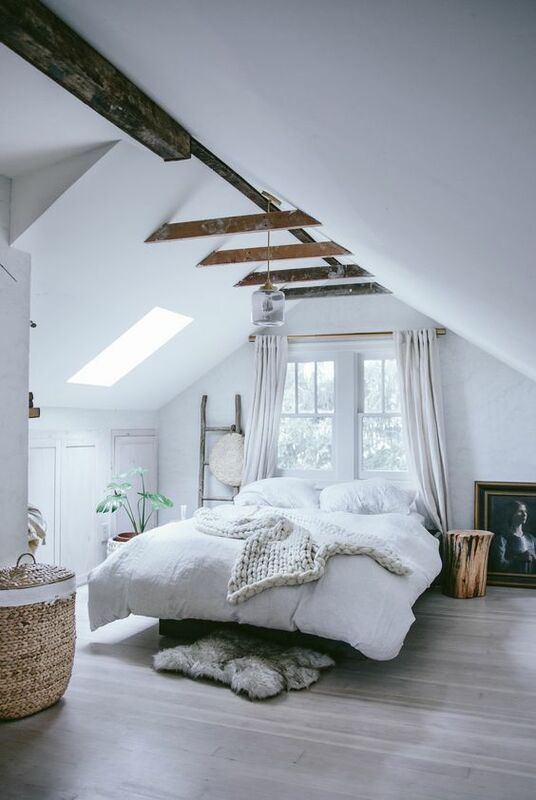 Attic bedrooms often feel separate and different to the rest of the house. They are often multi-functional - squeezing in a desk, computer, reading area, bookcase and coffee table. Grab a pen and paper to work out your perfect bedroom and see what you can cleverly add to your space without it feeling crowded. Add elements like wallpaper for interest. 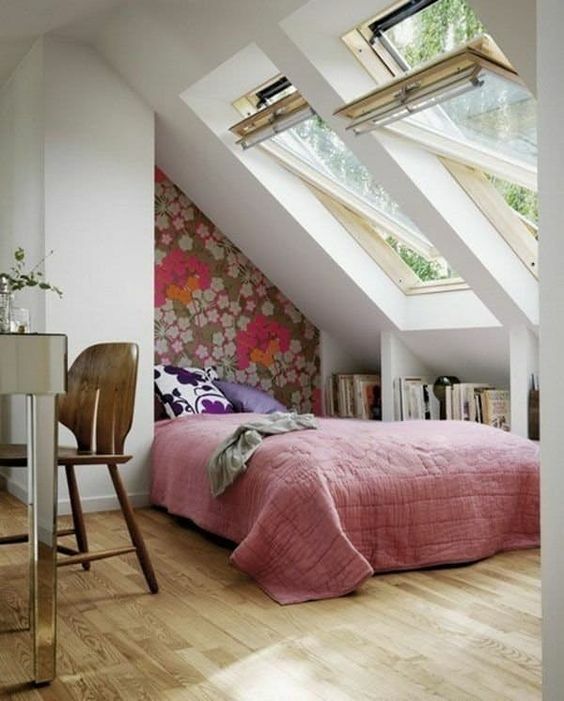 Functionality aside an easy way to add cozy to your attic bedroom is to create a window seat. It's perfect for reading, working, meditating, storage and creates a focal point. You can simply add an armchair, or remodel and build a window seat. A built-in bench saves precious floor space, gives you more natural task lighting and a place to add storage. 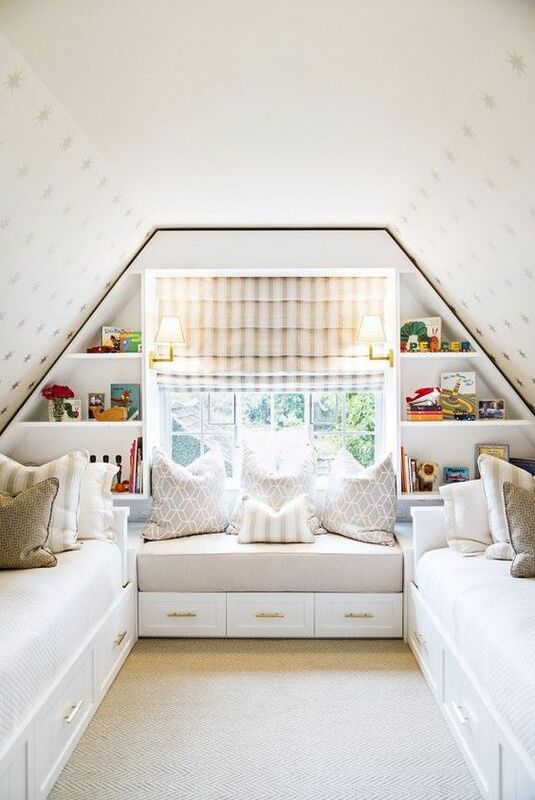 If your attic room is on the small side, consider built-in bookshelves, drawers or closets. 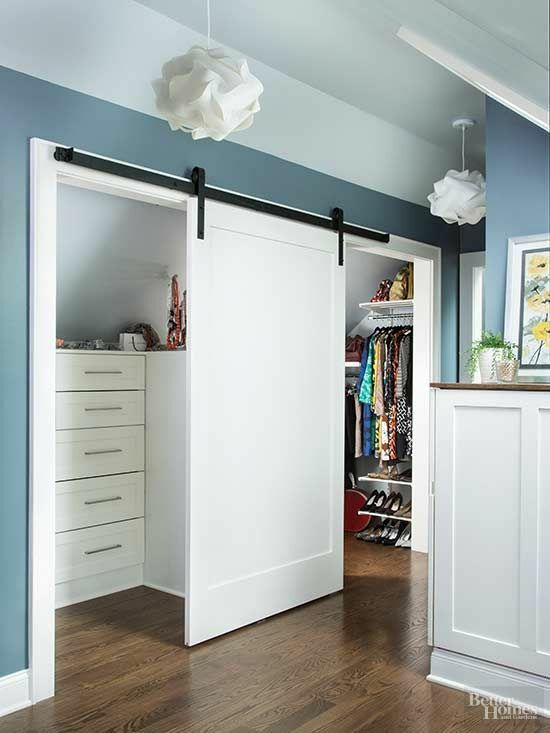 They can be thin, extend to the ceiling and even cover entire walls like the wall of storage above. 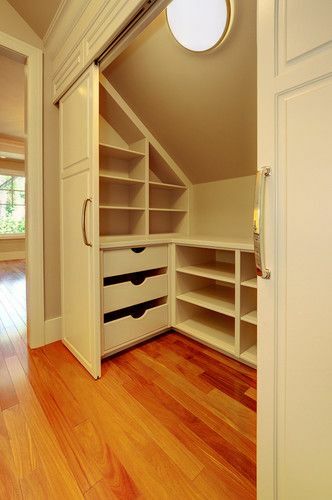 The more storage, the more your room will feel open and uncluttered. Disguise storage by keeping it flush against the walls, painted the same wall colors or behind doors. 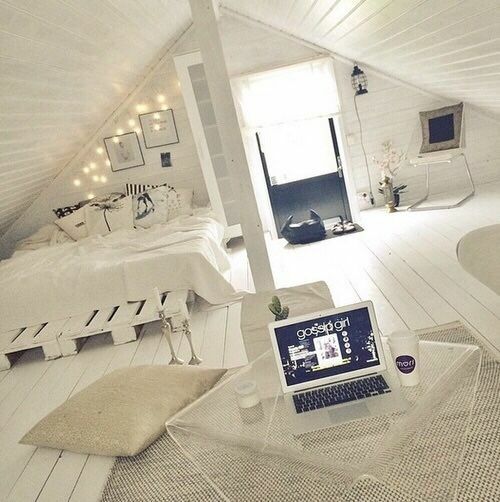 To keep that open, airy feeling, your attic room should have as little furniture as possible. Match furniture colors to your walls and floors, particularly if you have white or light colored walls and floors. 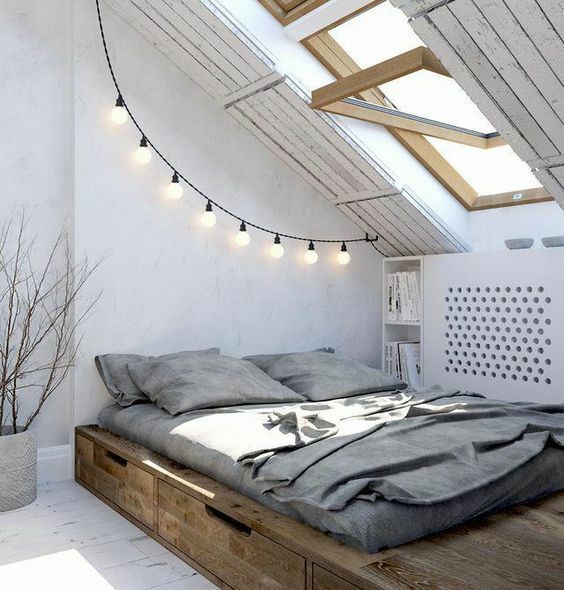 This will create an attic room with a relaxed, flawless feel. Chandeliers are great if you have a high vaulted ceiling. They clear the floor of floor lamps and walls of sconces and create a beautiful central room feature. But they are not the only choice in town. You can be very creative with lighting, depending on your decorating style and budget. If adding lighting becomes expensive or difficult, adding standing lamps as a feature as well as a lighting source is a clever decorating tip. 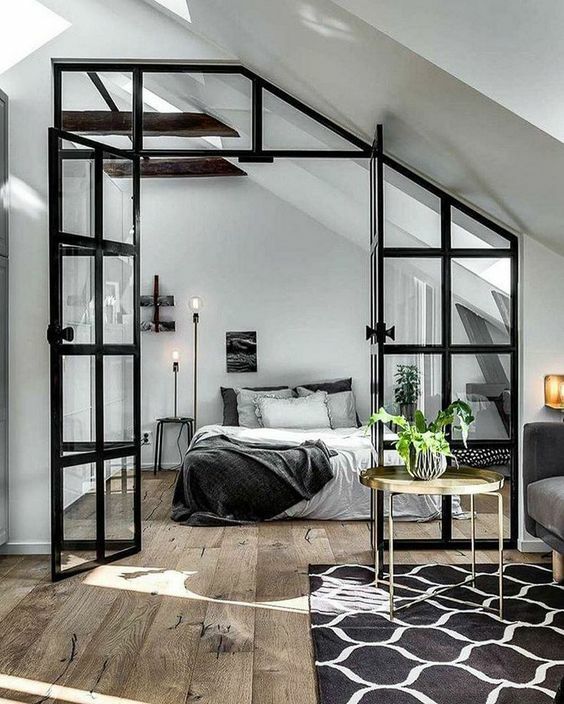 These black framed doors with glass to the ceiling make the space feel more luxurious and still very light. 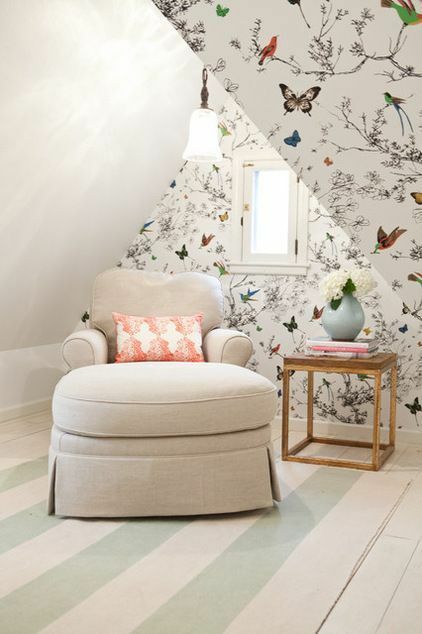 Stripes, florals or plaids in a small attic room can be fussy. But using one or two pieces, like a patterned bedspread, armchair or cushions, could add a little fun and the splash of color you need. Texture isn't always about fabric. Sometimes its an exposed chimney or exposed beams, textured paints and finishes or wall papers. Unlike fabric or furniture, these textures are built right into the building. The exposed beams below add texture, contrast and instant warmth. Painting the ceiling beams dark brown or black is a great way to draw the eyes upwards, but you can also white wash your beams and rafters for a softer look. Paneling placed vertically will heighten the room, making it appear taller. When placed horizontally, paneling can elongate or widen a room. 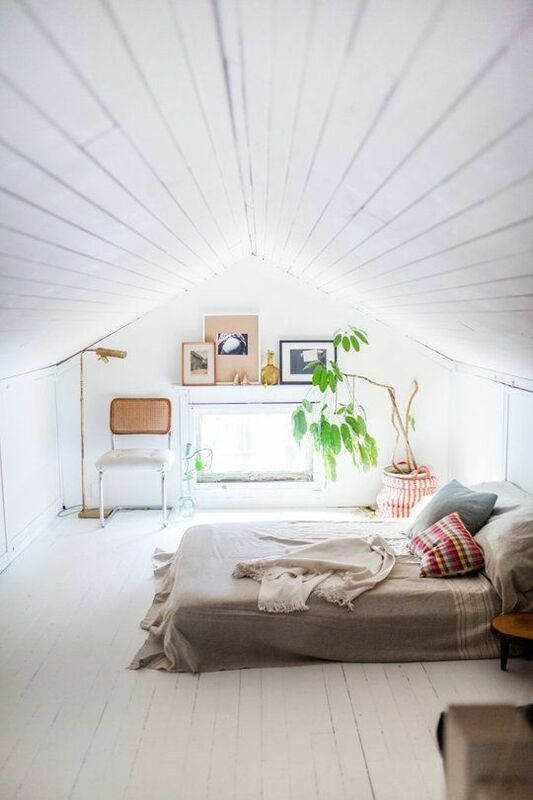 This is a great idea if the bedroom is in a narrow attic space. Is White the Best Paint Color? Keeping walls and ceiling the same light paint color make attic bedrooms look larger. Bold, dark or textured walls are the perfect addition if you have a lot of natural light. If you decide to paint one bold or dark accent wall, select the tallest vertical wall. An accent wall is a great splash of color or pattern without taking over. 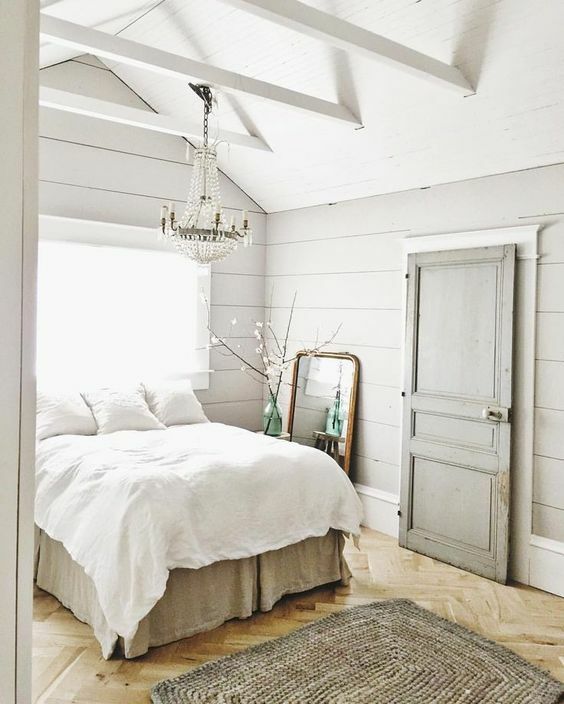 Watch this video for some attic bedroom design ideas. 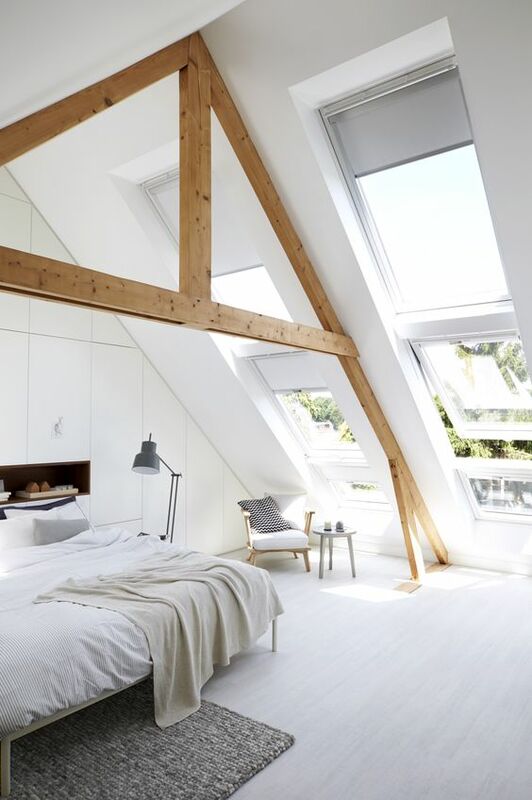 There's a lot to be said for great windows, especially in an attic where natural light can be a premium. Most of the time vertical windows are the easiest to put into place. Slick window shutters flush against the wall, will save your attic bedroom space, while drapes will add softness and texture. If privacy is an issue consider slanted windows. 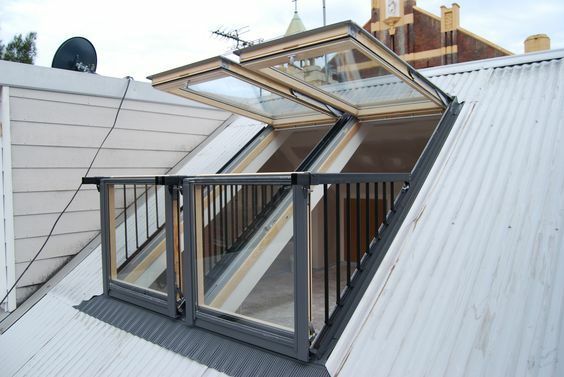 They use the roof line and not the house wall structure and sometimes can be the best solution to your window problem. Privacy may not be an issue but keeping the heat in might be. Do all your research before you remodel your attic bedroom. Which one is your favorite style?